Equipment Leasing Blog: Warehousing Systems, Office Equipment, and Forklifts, Oh My! Warehousing Systems, Office Equipment, and Forklifts, Oh My! Heavy equipment leasing has never been an easier process through Tiger Leasing’s numerous, flexible equipment leasing programs. We offer innovative financing solutions in order for you to find the leasing program that works perfectly for your business, such as a seasonal payment, deferred payment, municipal lease, etc. If you think heavy equipment leasing through Tiger Leasing is the right move for your business, please contact one of our representatives today. Whether you need to lease warehousing systems, office equipment and furniture, or forklifts, you can trust that we will work diligently to provide only the best quality of heavy equipment and financing solutions. After all, Tiger Leasing has more than 50 years of combined management experience. Use our Tax Savings Calculator to find out how to lower the true cost of ownership on your business equipment. Not sure how much leasing heavy equipment is going to cost? Feel free to visit our website and utilize the LeaseCalc™. This great resource can provide you with estimated costs to help you put financing into perspective. If you're ready to submit an application, please visit our website and fill out our online lease application. With our quick and easy financing programs, Tiger Leasing can be a valuable financing resource to all types of business owners. Our flexible programs allow businesses to conserve cash and working capital, preserve credit lines and provide a variety of tax benefits and deductions. Instead of approaching the equipment leasing industry with a business-focused approach, Tiger Leasing understands the importance of placing importance on customer satisfaction. We want to make sure that our customers are happy so that their customers are happy. Interested in heavy equipment leasing, or just want to know a little bit more about our flexible financing solutions? 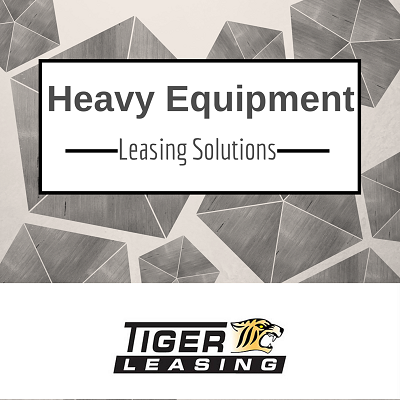 Please feel free to contact a Tiger Leasing representative; we’d love to have a conversation about heavy equipment leasing and financing with you!